Gorgonians, the elegant Sea Fans and Sea whips! Gorgonain Informaton, Gorgonian care for all types of gorgonians, and Gorgonian Photos. The Purple Bush Sea Fan is a great reef tank gorgonian as it's small, hardy, and easy to propagate! The Purple Bush Muriceopsis flavida is a pretty little gorgonian. Although it is a rapid grower, it will only reach a maximum of 12 inches in height, making it one of the better gorgonian choices for the moderately small reef reef aquarium. It is also quite durable when provided with the necessary light and water movement, making it a good selection for reef enthusiasts. The Purple Bush sea fan is a photosynthetic gorgonian found in the Caribbean. In the wild, it forms tall colonies with round branches that point up and are pinnate. Pinnate means it has "pinnules" on small side branches of the polyp tentacles, giving it a more gentle "feather-like" appearance. Other gorgonians with a plume-like form are the Pseudopterogorgia species. The Purple Bush sea fan can sometimes be confused with them but its branches are round and thicker. With its feathery look and colors varying from purplish gray to yellow with similarly colored polyps, it has a number of descriptive common names. These include Purple Brush Gorgonian, Purple Frilly Gorgonian, Purple Plume Gorgonia, Purple Sea Plume, and Purple Feather Gorgonian. Other common names are Rough Sea Plume, Feather Gorgonian, Lamarck's Gorgonian, Bottle-Brush Coral, Sea Rod, and Candelabrum. The Muriceopsis genus can be easy to moderate to care for as long as you provide the necessary light and water movement. They have a symbiotic relationship with a marine algae known as zooxanthellae, and receive some of their nutrients from it. Although the Purple Bush needs light, it is easier to care for because it is less demanding as far as feeding is concerned. It still needs supplemental feeding, but unlike gorgonians without zooxanthellae, it will not quickly die if not fed. See Care of Photosynthetic Gorgonians. They require strong currents and a good light source. The Purple Bush is semi-aggressive. It will sometimes produces sweeper tentacles to sting its neighbors, so be careful that it is not close enough to injure others. Other gorgonians can over take the Muriceopsis corals, so they will need to be kept at a distance as well. The Purple Bush Sea Fan is the only other plumelike Atlantic gorgonians. They have cylindrical branchlets which sets them apart from Pseudopterogorgia. They are found in shallower waters in various habitats and can be brown or yellow, however purple to purple-gray are the most common. They are not as easy to care for unless the water quality is good. They will shed their outer layer and rind periodically, appearing to be dead, so do not throw it away too soon! This video is quite relaxing! The Purple Sea Blade, found in the same waters as the Purple Bush Sea Fan compliment each other! Purple Sea Blades are a little less "fluffy" having flat blades, which help slow down water and the floating yummy foods it carries. Their polyps grow on the edges of the blades and even though the polyps are white (which non-photosynthetic have), they actually are a photosynthetic gorgonian. This Purple Sea Blade also has a "sister, P. citrinia which is bright yellow, orange or brown with white polyps, and the olive colored morph is the most commonly collected for the marine trade. They need to be fed daily, have strong water movement, strong lighting, ZERO phosphates and good water quality. The Muriceopsis genus was described by Aurivillius in 1931. The Muriceopsis genus has 6 species currently described, with new species being discovered. They are in the Class Anthozoa, Subclass Octocorallia, Order Alcyonacea, and Suborder Holaxonia (much sturdier species than Scleraxonia). The Muriceopsis genus is then placed in the Plexauridae family. This family of gorgonians are found primarily found in shallow subtropical to tropical waters. Many contain the symbiotic marine algae called zooxanthellae, and the colors they can come in are brown, yellow, red, purple and purplish gray. The Muriceopsis genus has not been evaluated by the IUCN Red List for endangered species. The classification of gorgonians in general is done by some simple visual clues such as colony size, shape, axis structure, color, polyp placement, and pattern of branches. Getting a little more technical, they also look to see if the polyp is autozooid or siphonozooid. Then there is the more exacting use of chemotaxonomy. used to show the different terpenoids or other chemicals produced by each gorgonian species. The Purple Bush Muriceopsis flavida was first described by Lamarck in 1815. Other common names these corals are known by that are descriptive of their coloration include Purple Brush Gorgonian, Purple Frilly Gorgonian, Purple Plume Gorgonia, Purple Sea Plume, and Purple Feather Gorgonian. Other common names, primarily descriptive of their structure, are Rough Sea Plume, Feather Gorgonian, Lamarck's Gorgonian, Bottle-Brush Coral, Sea Rod, and Candelabrum. This species is found in tropical waters of Caribbean, Costa Rica, Panama and Colombia. This species is found in the Tropical Eastern Pacific including Panama from 13 to 20 feet (4 to 6 meters). This species is known by the common name Deep Water Sea Plume and is found along the coasts of the United State and Canada, mainly in South Florida and the Bahamas (Humann, 1993). It occurs only on reef slopes at depths up to 100 feet (30 meters) or more. This species is known by the common name Spiny Gorgonian or Sulfur Soft Coral. It is found in Florida, Panama, Caribbean and Abrolhos Archipelago, Brazil. They occur in warm waters that are shallow and brightly lit. The Muriceopsis genus are found in the Western Atlantic near Florida, the Gulf of Mexico and the Caribbean. While this genus as is found from Canada, the east coast of the USA, Gulf of Mexico and to the eastern most point of the Brazilian east coast, the Purple Bush Sea Fan is found in the warmer ranges near Florida, the Gulf of Mexico, Lee Stocking Islands in the Bahamas and the Caribbean. Recently, the Purple Bush Sea Fan has been found off the coasts of the states of Maranhao, Pernambuco, and Alagoas of Brazil. The Purple Bush Sea Fan prefers the shallow to mid-depth waters in a wide variety of reef habitats. They can be found from 10 to 49 feet (3 to 15 meters). However, there are deep water Muriceopsis species that can be found at 100 feet (30 m) or more. In fact, one scientific paper states having found a specimen at 246 feet (75 meters) off the coast of Brazil! They feed on planktonic foods and tiny micro organisms found in the water, along with dissolved organics. Their symbiotic relationship with the marine algae, zooxanthellae, also provides another source of nutrition. The Purple Bush has an interesting formation, looking almost like a bottle brush. Depending on water movement, they can form different shapes. A bushy appearance occurs in turbulent waters. A flat fan shape occurs when the water current sways the gorgonian back and forth. Besides the Pseudopterogorgia genus, the Muriceopsis genus is the only other plume-like gorgonian in the Atlantic Ocean. Lifespan is unknown. The growth formation of the Purple Bush is a lateral structure. The main branch is located in the middle with cylindrical branchlets extending out from it, and each forming its own plume. These tall and thin branches are uniformly pinnate (meaning there are even pairs opposite from each other). There are also secondary small branches that are short and also pinnate. They are alternating slender and sparse, and are spaced less than 7/16” (1 cm) from each other. Their coloring can range from purplish gray to yellow with similarly colored polyps, and they do develop sweeper tentacles (Sprung and Delbeek, 1997). Small fuzzy polyps are scattered along the entire colony. They protrude out of small raised areas or “calyces” in the rind, making the coral look feathery in appearance. When the polyps withdraw, the rind looks "bumpy." 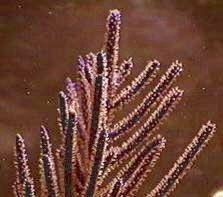 What sets the Purple Bush Sea Fan apart from the other species in this genus is that is has a pinnate pattern with sparse branches, elongated spindles on the outer cortex and the purple spindles on the inner cortex. They are 3.7” to 12” (9.5 to 30.5 cm) tall and are 1” to 4.4” (3 to 11 cm) wide. It is unknown how long they live. Size of organism - inches: 12.0 inches (30.48 cm) - These gorgonians can grow to 12” (30.48 cm) tall and 4.4” (11 cm) wide. The Purple Bush can be easy to moderate to care for. They are easier than other photosynthetic gorgonians as long as you provide necessary light and water movement. These gorgonians will shed their outer layer and at times the branch tips look like a dead twig. Do not throw it away! This is common and will occur fairly regularly in reef tanks due to sediment and detritus build up. They do best with clean, stable water parameters, zero phosphates, and moderate lighting. Gorgonians in general can be overtaken by cyanobacteria or algae. A moderate to strong water movement will in preventing this. Avoid wide fluctuations in water parameters like salinity. Aquarium Hardiness: Moderately hardy - Hardy gorgonians as long as they are fed and the water is kept clean and stable. Aquarist Experience Level: Beginner - Suggested for a dedicated beginner or an intermediate aquarist. These gorgonian corals have developed several feeding strategies. They capture planktonic organisms and microscopic food particles from the water column, and can absorb dissolved organic matter. Unlike a lot of other Gorgonians, the Purple Bush M. flavida has a symbiotic relationship with a marine algae known as zooxanthellae, where they receive some of their nutrients. In captivity, the Purple Bush can be fed enriched Artemia nauplii, rotifers, dust-sized pellet food, copepods, daphnia, and other similar sized foods. Marine Snow many also be a good food source. Stirring the substrate to suspend edible particulates is helpful, along with the presence of fish which can also help nourish it. Feed every other day depending on appearance. Diet Type: Omnivore - Nutrition is obtained by capturing food particles from the water column and absorbing dissolved organic matter, along with lighting and the marine algae. Flake Food: No - Will not eat this. Tablet / Pellet: No - Will not eat this. Live foods (fishes, shrimps, worms): Some of Diet - Tiny live plankton. Liquid Foods: Some of Diet - Marine snow or other phytoplankton substitutes. Meaty Food: Some of Diet - Zooplankton they capture from the water column. Feeding Frequency: Weekly - Feed this Gorgonian a few times per week. Clean, stable tank conditions are needed to keep the Purple Bush Sea Fan. Doing water changes of 10% biweekly or 20% a month is needed, although it is suggested that doing 5% water changes once a week will replenish many of the needed additives. Iodine, calcium, strontium, and other trace elements can be added. Calcium Levels: 400.0 - 450.0 ppm - If using Seachem's calcium, 385 should suffice. Magnesium Levels: 1,200.0 - 1,350.0 ppm - Adjust magnesium levels before checking calcium levels. Iodine Levels: - Add as directed on the label. The Bushy Sea Rod is a smaller gorgonian that only reaches up to 12 inches. A typical live rock/reef environment, along with some fish for organic matter production, is needed for this gorgonian to thrive. Provide a moderately sized aquarium that is 50 gallons or more that's a minimum of 12" tall. A mature tank (well over a year old) is advised to increase the successful keeping of Muriceopsis. Provide proper lighting and water movement. A moderate to strong water flow and a moderate to bright light source are required for the Purple Bush Sea Fan to do well. Provide enough water flow to avoid having cyanobacteria grow on them. The Purple Bush Sea Fans like a sandy bottom, but they must be anchored down to keep them from getting blown over. These Gorgonians are a semi-aggressive species and can extend sweeper tentacles, so adequate space should be provided between them and other corals. Minimum Tank Size: 50 gal (189 L) - The tank needs to be a minimum of 12" tall to accommodate the height of these gorgonians. Substrate Type: - The Purple Bush will utilize nutrients from the substrate when it's stirred up. Lighting Needs: Moderate - normal lighting - Provide moderate to bright light. Water Movement: Moderate - This gorgonian needs a moderate to strong water flow. The Purple Bush is semi-aggressive. It will sometimes produces sweeper tentacles to sting its neighbors, so be careful that it is not close enough to injure others. Other gorgonians can over take the Muriceopsis corals, so they will need to be kept at a distance as well. Butterflyfish and Parrotfish feed on gorgonian polyps or tissue. These fish will constantly chow, so they are not the best idea for a tank mate. Some angelfish will also pick at the polyps, but can be housed with them if the angelfish is well fed. Avoid the Flamingo Tongue snail which is readily available for purchase since it will eat your gorgonian. Avoid snails from the Murex genus too, as they will attack this species. Venomous: No - It will sometimes produces sweeper tentacles that can sting weaker corals. Anemones: Monitor - Keep the gorgonian out of their reach. Mushroom Anemones - Corallimorphs: Monitor - Keep the gorgonian out of their reach. Leather Corals: Monitor - Keep the gorgonian out of their reach. Zoanthids - Button Polyps, Sea Mats: Monitor - Keep the gorgonian out of their reach. Starfish: Monitor - Only safe with "reef safe" starfish. Feather Dusters, Bristle Worms, Flatworms: Monitor - Should be safe, but it is unknown if any or all species are safe..
Snails: Monitor - While most snails are safe, Murex genus snails and Flamingo Tongue snails will eat them. Sea Apples, Cucumbers: Threat - The gorgonian can die if these animals expel toxins. They are much more sensitive to these toxins than other invertebrates, even if the system is large. Nudibranch, Sea Slugs: Monitor - Should be safe, but it is unknown if any or all species are safe. Copepods, Amphipods, Mini Brittle Stars: Safe - All are safe, however there are a few predatory copepods that should be removed before placing in system. Stony Corals: May be aggressive - Keep the gorgonian out of their reach. Soft Corals: May be aggressive - Keep the gorgonian out of their reach. There are no discernible sexual differences. The Muriceopsis genus has been propagated in captivity. These corals can reproduce reproduce by breakage or fragmentation, and they may also spawn like other gorgonians for sexual reproduction. When ready to spawn the Purple Bush Sea Fan will release mature gametes into their digestive system, which is then released up and out through the mouth. After this spawning method, the zygote will develop into planktonic larvae or free floating in open waters. They will form tentacles, septa and a pharynx right before they settle into the reef with the mouth pointing upward. Propagation of gorgonians consists of using severing or clean cuts. Tearing the coral will result in infection. Be cautious with the use of glues epoxy or cements, as many gorgonians react badly to the chemicals. However an underwater epoxy has been suggested by some. Containment is recommended if the frag survives. This involves keeping the frag in one spot, say a small piece of upright pvc, around the same height as the frag, with sand or rubble at the bottom. This will keep the frag from blowing over before it can take root. It is suggested to drill holes in the pvc to keep the water flowing. Ease of Breeding: Easy - Easy to propagate with frags, but is not easy to breed via spawning. The Purple Bush is susceptible to algae and cyanobacteria accumulating on its branches. The Muriceopsis genus, needing light, can get red band and black band infections that are caused by cyanobacteria. Keeping water flow strong will help prevent these ailments, but if your gorgonian does get these, you can at times cut off the bad part and hope the rest will recover. Freshwater dips can also kill cyanobacteria, and are an effective treatment. This ailment is characterized by a leading band of black gooey material (mostly algae), which leaves a denuded skeleton behind. The bare skeleton then becomes covered with many species of algae. You can use a needle to lift the black band from the coral skeleton. With a small diameter airline tubing, siphon the black front away, catching any loosened debris as well. If it is not possible to remove all of the black band, you may be able to treat the area directly by applying a small amount of Erythromycin or Chloramphenicol. As the name "red band" indicates, this ailment is characterized by a brick red or dark brown band. The band is a soft microbial mat which will easily dislodge from the surface of the coral. The Purple Bush is also a food source for Flamingo Tongue Snails Cyphoma spp.. These snails prey on many other photosynthetic gorgonians as well. The Purple Bush M. flavida is usually available at pet shops and online. They are moderately inexpensive, but the price can vary somewhat, depending on size and color. This gorgonian will also be found under the common names Purple Brush Gorgonian, Rough Sea Plume, Feather Gorgonian, Purple Frilly, or variations of these.